FLORHAM PARK, N.J. (AP) — The New York Jets placed left guard James Carpenter on the injured reserve list Wednesday with a shoulder injury, ending the season for one of the team’s most reliable players. Carpenter had started in 58 straight games since signing with the Jets as a free agent in 2015 until missing New York’s 27-13 loss to New England last Sunday. Center Spencer Long, who was struggling with a finger injury that was causing him to misfire on some shotgun snaps, moved from center to left guard last week against the Patriots. Jonotthan Harrison took over in Long’s spot, and it appears that could be the plan moving forward. Bowles mentioned that backups Dakota Dozier and Brent Qvale could also factor into the mix. 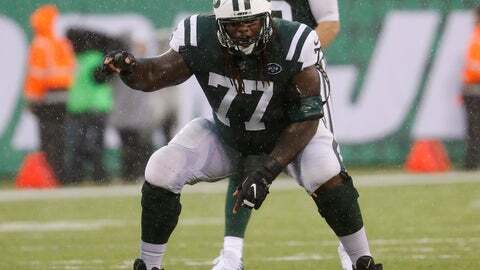 The Jets also announced they promoted offensive lineman Ben Braden from the practice squad. Braden was signed by New York as an undrafted free agent out of Michigan last year, when he spent the entire season on the practice squad. He made the Jets’ initial roster out of training camp this year and was inactive for the season opener, but was later cut and then re-signed to the practice squad.